Did you know that the immense gravity of a black hole can convert matter into energy more efficiently than the nuclear fusion inside stars does…? Interestingly, it turns out I was wrong in my previous post. As it happens, black holes can have surrounding chemistry. 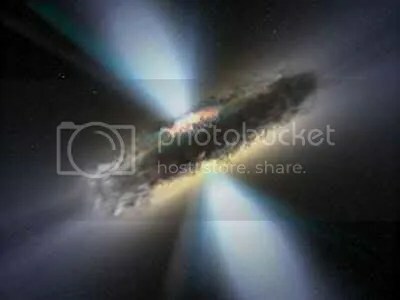 This image shows an artist’s impression (not mine) of a black hole surrounded by a molecular cloud. X-ray observatories have found that some x-ray ‘colours’ vary drastically with time, while others remain constant. In other words, around some black holes, something is scattering the x-rays before they get to us. Quite a good indication, as it happens, of black hole chemistry, with dust molecular gas and atomised metals (the sort of things that are generally quite good at scattering x-rays). Thus far, this has only been observed in the central supermassive black holes in certain bright galaxies, but logically, there’s no reason why phenomena like this should restrict themselves to large scales. Recently too, astronomers have discovered the largest black hole in the known universe. At 18 billion solar masses, it weighs in as much as a small galaxy. The mass was calculated thanks to a second black hole in orbit which weighs only around 100 million suns. Not that there’s anything ‘only’ about an object that massive! The two are actually in a decaying orbit too, edging slowly closer. At the rate they’re going, they’re set to merge in about 10,000 years to form one gigamassive black hole! No one knows if there’s an upper size limit to these things either. As far as we know, they could just keep growing indefinitely. Most black holes though, are much smaller. In fact, some scientists believe that rogue black holes might roam the galaxy freely and virtually undetectably. A slightly disconcerting thought, to be honest, especially seeing as the Milky Way is old. Very old. Millions of black holes must have been formed since the Milky Way was young. But then… Much about these strange beasts is yet unknown. Everything we think we know is still actually a theory, and it’s not like we’ve actually been to any to find out for certain. Maybe someday we’ll know for certain all about black holes. In the meantime, I’m fairly certain our solar system isn’t going to be ripped to atoms by a marauding monster anytime soon. This entry was posted in astronomy, Imported from Livejournal and tagged astrochemistry, black holes. Bookmark the permalink.